KANSAS CITY, Kan. – Although he says he slept well on Monday night, Kansas Speedway president Pat Warren looked and sounded relieved after Tuesday’s first day of a two-day Goodyear tire test at his newly repaved 1.5-mile tri-oval. That’s to be expected as the Kansas project has been one of the most scrutinized repaves in NASCAR during an era in which asphalt and banking have become as controversial as bump drafts and helmet tosses. With some fans, a batch of media members and a large contingent of the top drivers in Sprint Cup criticizing the decision to tear up the mature, highly racy asphalt and replace it with new a new layer – and on top of a track reconfigured with variable banking – Warren and his pavers simply had to produce something good to great. On Tuesday, Warren got good news from drivers and teams. On Wednesday, he got similar reviews from the folks at Goodyear. The only glitch in the two days of testing came Wednesday morning when Dale Earnhardt Jr. cut a tire and hit an outside wall. Earnhardt was uninjured in the incident. This week’s test will not be the last for the new Kansas surface. 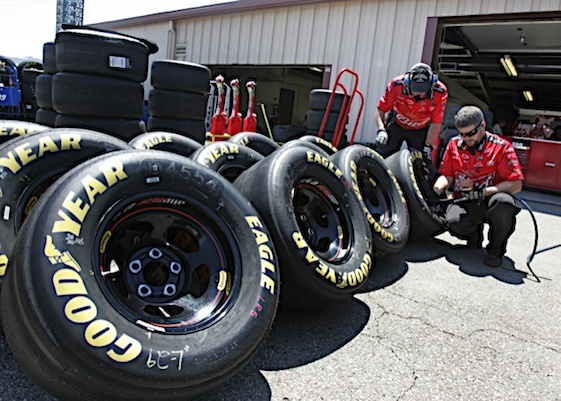 Teams will report to the track two days early for October’s Sprint Cup weekend. That test will be open to all teams. This week’s test was confined to nine teams and drivers: The No. 2 Penske Racing Dodge with Brad Keselowski, No. 9 Richard Petty Motorsports Ford with Marcos Ambrose, No. 17 Roush-Fenway Racing Ford with Matt Kenseth, No. 20 Joe Gibbs Racing Toyota with Joey Logano, No. 27 Richard Childress Racing Chevrolet with Paul Menard, No. 42 Chip Ganassi Racing Toyota with Juan Pablo Montoya, No. 55 Michael Waltrip Racing Toyota with Mark Martin, No. 78 Furniture Row Racing Chevrolet with Regan Smith and No. 88 Hendrick Motorsports Chevrolet with Earnhardt Jr.